2008-05-19 Application filed by 프리스케일 세미컨덕터, 인크. filed Critical 프리스케일 세미컨덕터, 인크. 수리할 수 있는 메모리 어레이(301)를 가진 시스템은 제조 후 검출된 하나 또는 그 이상의 결함 메모리 셀들을 대체하기 위한 리던던트 메모리 셀들을 가진다. Having a memory array (301) to repair the system has redundant memory cells to replace one or more defective memory cells detected after manufacture. 시스템은 또한 동작 전류, 동작 전압, 저항, 캐패시턴스, 타이밍 특성들 및 동작 모드 같은 하나 또는 그 이상의 동작 파라미터들을 조절할 수 있는 회로를 가진 비메모리 어레이 회로들을 포함한다. 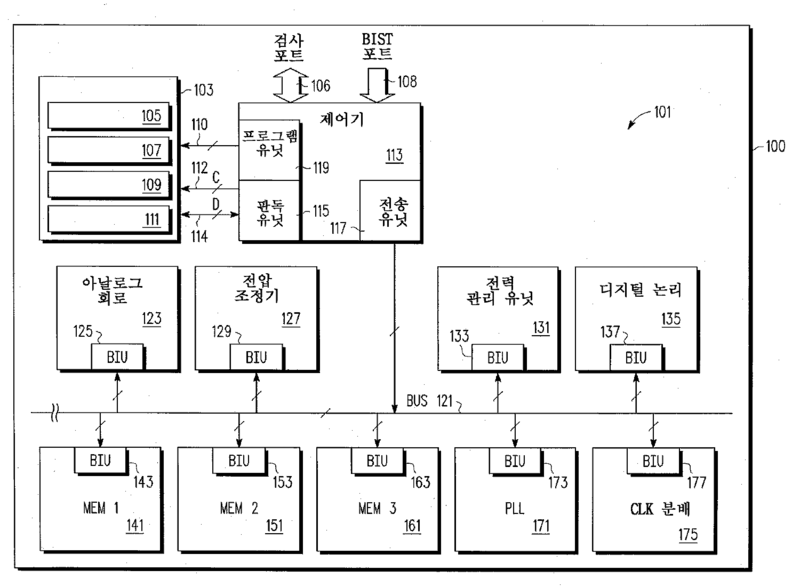 The system also includes a non-memory array circuit having a circuit capable of controlling the operating current, operating voltage, resistance, capacitance, timing characteristics and mode of operation of one or more operating parameters: 한 세트의 1회 프로그램 가능 엘리먼트들(105)은 동작 파라미터들을 변형하고 리던던트 메모리 셀들로 결함 메모리 셀들을 대체하기 위한 정보를 선택적으로 저장하기 위해 사용될 수 있다. The one time programmable elements in a set 105 can be used to modify operating parameters and selectively storing the information to replace defective memory cells with redundant memory cells. 본 발명은 일반적으로 집적 회로들 및 특히 1회 프로그램 가능 엘리먼트들을 가진 집적 회로들에 관한 것이다. The present invention relates generally to integrated circuits, and in particular integrated circuit having one time programmable elements. 퓨즈들 및 PROM 셀들 같은 1회 프로그램 가능(OTP) 엘리먼트들은 집적 회로의 제조 후 회로를 조절하기 위하여 집적 회로들에 사용된다. One time programmable (OTP) elements, such as fuses and PROM cells are used in integrated circuits to control the circuit after manufacture of the integrated circuit. 예를 들어, 프로그램 가능 퓨즈는 특정 조건들 동안 집적 회로의 회로를 조절하거나 제조 결함들을 수정하기 위해 사용될 수 있다. For example, the programmable fuse can be used to control the circuitry of the integrated circuit for a particular condition or modify the manufacturing defects. OTP 엘리먼트들의 하나의 특정 용도는 메모리 어레이의 결함 셀들을 대체할 때 리던던트 셀들의 사용을 제어하는 수리 정보를 제공하는 것이다. One particular use of the OTP element is to provide repair information for controlling the use of the redundant cell when replacing the defective cell in the memory array. 다른 용도는 아날로그 회로의 캐패시티브(capacitive) 또는 레지스티브(resistive) 값을 트리밍(trimming)하거나 시스템 부분들을 인에이블링하고 디스에이블링함으로써 아날로그 회로를 동조시키는 것이다. Another purpose is to tune the analog circuit by enabling and disabling the trimming (trimming) a capacitive (capacitive) or ledge Steve (resistive) value of an analog circuit, or part of the system. 최근 경향은 동일한 제품이 공통 처리 기술을 통해 다른 제조 설비들에서 제조되는 것이다. A recent trend is that the same product is made in other production equipment on a common processing techniques. 최선의 엔지니어링 노력들에도 불구하고, 각각의 설비가 약간 다른 프로세스를 가질 가능성이 있다. Despite the best engineering efforts, there is the possibility that each of the plants have a slightly different process. OTP 엘리먼트들의 사용은 각각의 제조 설비에 대한 생산 기능의 독립적인 최적화를 허용한다. Use of the OTP element allows independent optimization of the production capability for each of the production equipment. 집적 회로 기술이 발전함에 따라, 집적 회로 피쳐들(예를 들어, 트랜지스터 게이트 길이)은 감소하였고, 집적 회로에 보다 많은 회로가 구현되게 한다. , Integrated circuit features, as integrated circuit technology advances (e.g., the transistor gate length) is decreased, causing more circuits are implemented in an integrated circuit. 집적 회로에 퓨즈 같은 OTP 엘리먼트들을 구현하는 것에 관한 하나의 도전은 트랜지스터 피쳐들 크기의 감소와 거의 동일한 속도로 퓨즈 크기 감소가 진행되지 않는다는 것이다. One challenge relates to the implementation of the OTP elements such fuse the integrated circuit is substantially the same as the speed and the reduction of the transistor feature size fuse size reduction is not conducted. 따라서, 퓨즈들은 집적 회로 기술이 진보할 때 집적 회로의 보다 큰 상대적 부분을 요구할 수 있다. Therefore, the fuse may require a relatively larger portion of the integrated circuit when the integrated circuit to technology advances. OTP 엘리먼트들을 사용하는 몇몇 집적 회로들에서, 다른 회로들 각각은 메모리 어레이에 리던던시 수리 정보를 제공하고 예를 들어 트리밍, 동조, 및/또는 타이밍 조절들을 위한 비메모리 어레이 회로들을 위한 비리던던시 정보를 제공하는 전용 OTP 엘리먼트들을 포함한다. In some integrated circuits that use OTP elements, other circuits, each of which provides a redundancy repair information in the memory array and provide a non-redundant information for non-memory array circuitry for example trimmed, tuning, and / or timing adjustment Yes It includes a dedicated OTP element. 예를 들어, 아날로그 회로의 각각의 구성 가능한 회로는 그 피쳐를 프로그래밍하기 위한 능력을 제공하기 위한 그 자신의 OTP 엘리먼트들을 포함한다. For example, each configurable circuit of the analog circuit includes its own OTP element for providing the ability to program the feature. 상기 시스템은 필요할 수 있는 보다 큰 수의 OTP 엘리먼트들을 포함한다. The system includes the elements of the OTP can be larger than that it may be needed. 필요한 것은 메모리 어레이 회로들 및 비메모리 어레이 회로들 모두를 포함하는 OTP 엘리먼트들을 집적 회로내에 구현하기 위한 개선된 기술이다. What is needed is an improved technique for implementing the OTP element that includes both the memory array circuit and a non-memory array circuit in the integrated circuit. 게다가, 단일화된 방법이 메모리 어레이 회로들 및 비메모리 어레이 회로들을 포함하는 회로들의 다중 등급들에 대한 OTP 엘리먼트 솔루션들을 구현하기 위해 사용되는 것은 바람직하다. In addition, being a unified method used to implement the OTP element solution for the multiple class of circuits including a memory array circuit and a non-memory array circuit. 본 발명은 첨부 도면들을 참조하여 당업자에게 명백한 다수의 목적들, 피쳐들, 및 장점들이 잘 이해될 수 있다. The invention can be with reference to a number of objects, features, and advantages are apparent to those skilled in the art understand the accompanying drawings. 도 1은 본 발명의 일 실시예에 따른 집적 회로의 OTP 엘리먼트 시스템의 블록도. 1 is a block diagram of an OTP system elements of an integrated circuit according to one embodiment of the present invention. 도 2는 본 발명의 일 실시예에 따른 도 1의 회로의 일 실시예의 블록도. Figure 2 is a block diagram of one embodiment of the circuit of Figure 1 according to one embodiment of the present invention. 도 3은 본 발명의 일 실시예에 따른 도 1의 회로의 일 실시예의 블록도. Figure 3 is a block diagram of one embodiment of the circuit of Figure 1 according to one embodiment of the present invention. 도 4는 본 발명의 일 실시예에 따른 도 1의 회로의 일 실시예의 블록도. 4 is a block diagram of one embodiment of the circuit of Figure 1 according to one embodiment of the present invention. 도 5는 본 발명의 일 실시예에 따른 퓨즈 뱅크의 블록도. Figure 5 is a block diagram of a fuse bank according to one embodiment of the present invention. 도 6은 본 발명의 일 실시예에 따른 퓨즈 시스템의 퓨즈 필드들을 나타내는 도면. Figure 6 is a view showing the fuse of the fuse-field system in accordance with one embodiment of the present invention. 도 7은 본 발명의 일 실시예에 따른 집적 회로의 퓨즈 시스템의 설계 및 프로그래밍 동작들을 도시하는 흐름도. 7 is a flowchart showing the design and programming operation of the fuse system of the integrated circuit according to one embodiment of the present invention. 다른 도면들에서 동일한 참조 부호들의 사용은 만약 주의되지 않으면 동일한 아이템들을 가리킨다. The use of the same reference symbols in different drawings indicates identical items unless If attention. 도면들은 필수적으로 축적적으로 도시되지 않는다. The drawings are not necessarily shown to accumulate ever. 다음은 본 발명을 수행하기 위한 모드의 상세한 설명을 나타낸다. The following sets forth a detailed description of a mode for carrying out the present invention. 상기 설명은 본 발명을 예시하는 것이고 제한하는 것이 아니어야 한다. The above description is to illustrate the invention and should not be limited. 도 1은 집적 회로(100)의 퓨즈 시스템의 블록도이다. Figure 1 is a block diagram of a fuse system of the integrated circuit 100. 퓨즈 시스템(101)은 다수의 장치들 중 임의의 하나 사이에서 프로그램 가능한 퓨즈를 사용하기 위한 능력을 허용하여, 집적 회로에 퓨즈 시스템의 융통성을 제공한다. Fuse system 101 to allow the ability to use a programmable fuse between any one of a number of devices, and provides the flexibility of the integrated circuit fuse systems. 집적 회로(100)는 퓨즈 시스템(101)과 유사한 다른 퓨즈 시스템들을 포함할 수 있다. The integrated circuit 100 may include other similar systems fused and fuse system 101. 이들 시스템들 각각은 메모리 어레이 회로들 또는 비메모리 어레이 회로들 어느 하나, 또는 메모리 어레이 및 비메모리 어레이 회로들의 결합과 연관될 수 있다. Each of these systems may be the memory array circuit, or non-memory array circuitry associated with any one, or a memory array and a combination of a non-memory array circuit. 시스템(101)은 도 1에 도시된 퓨즈 뱅크들(105, 107, 109, 111)을 가진 다수의 퓨즈 뱅크들을 포함하는 퓨즈 어레이 회로(103)를 포함한다. The system 101 includes a fuse bank to the fuse array comprising a plurality of fuse banks with (105, 107, 109, 111) circuit 103 shown in Fig. 시스템(101)은 퓨즈 제어기(113)를 포함한다. The system 101 includes a fuse controller 113. 퓨즈 제어기(113)는 라인들(110)을 통해 퓨즈 어레이 회로(103)의 퓨즈들을 프로그래밍하기 위한 프로그램 유닛(119)을 포함한다. The fuse controller 113 comprises a program unit 119 for programming the fuses in fuse array circuit 103 via line 110. 제어기(113)는 어레이 회로(103)의 프로그래밍된 퓨즈들에 저장된 정보를 판독하기 위한 퓨즈 판독 유닛(115)을 포함한다. The controller 113 comprises a fuse reading unit 115 for reading information stored in the programmed fuse array of the circuit 103. The 제어기(113)는 또한 버스(121)상 장치들에 어레이 회로(103)의 퓨즈들에 저장된 정보를 제공하기 위한 전송 유닛(117)을 포함한다. The controller 113 also includes a transmitting unit 117 for providing the information stored in the fuse array of the circuit 103 to the device bus 121. 일 실시예에서, 프로그램 유닛(119)은 레이저 프로그램 가능 퓨즈들 같은 비전기적으로 프로그램 가능한 OTP 엘리먼트들과 반대로 전기적으로 프로그램 가능한 OTP 엘리먼트들에 사용된다. In one embodiment, the program unit 119 is used for electrically programmable OTP OTP element as opposed to the programmable element, such as electroless the laser programmable fuse. 제어기(113)는 퓨즈 시스템(101)에 액세스하기 위한 검사 포트(106) 및 BIST(Built in Self Test) 포트(108)를 포함한다. The controller 113 includes a test port 106 and a BIST (Built in Self Test) port 108 for accessing the fuse system 101. 검사 포트(106)는 스캔을 포함하는 다중 방법들을 사용하여 외부적으로 액세스될 수 있다. Test port 106 may be externally accessible by using multiple methods, including scanned. BIST 포트(108)는 메모리 어레이 회로들 또는 비메모리 어레이 회로들 어느 하나를 검사하기 위해 사용된 온칩 BIST 엔진들에 의해 제어될 수 있다. BIST port 108 may be controlled by the on-chip BIST engine used to check which one of the memory array circuit, or non-memory array circuit. 비전기 OTP 구현들에 대해, 양쪽 포트들은 레이저 프로그래밍 같은 비전기 수단을 사용하여 실제 프로그래밍 전에 수리 솔루션의 유효화를 위해 사용될 수 있다. For the electroless OTP implementation, the ports may be used for enabling the repair solution before the actual programming using the same laser programming non-electrical means. 전기 OTP 구현들에 대해, 검사 포 트(106)는 시스템 외부 제어를 요구하는 비자동 방법에 사용될 수 있다. For electrical OTP implementation, the inspection port 106 may be used for the non-automatic method by which the external control system. BIST 포트(108)는 외부 간섭없이 자동화 방식으로 프로그래밍 정보를 제공하기 위해 사용될 수 있다. BIST port 108 may be used to provide programming information to the automated way, without outside interference. 상기 BIST 포트(108)의 사용은 또한 자체-프로그래밍이라 불릴 수 있다. Use of the BIST port 108 is also self-it may be referred to as programming. 시스템(101)은 퓨즈 어레이 회로(103)(퓨즈 정보)의 프로그래밍된 퓨즈들에 저장된 정보를 사용하는 집적 회로(100)의 다수의 회로들을 포함한다. The system 101 comprises a number of circuits of the integrated circuit 100 which uses the information stored in the fuse programming of the fuse array circuit 103 (fuse information). 예를 들어, 시스템(101)은 집적 회로(100)의 동작을 위한 정보를 저장하기 위해 사용된 3개의 메모리 어레이 회로들(141, 151, 161)을 포함한다. For example, the system 101 includes the three memory array circuitry used to store information for the operation of the integrated circuit 100 (141, 151, 161). 메모리 어레이 회로들의 예들은 SRAM 메모리들, DRAM 메모리들, 및 비휘발성 메모리들(예를 들어, 플래시, MRAM)을 포함할 수 있다. Examples of the memory array circuit may include those of the SRAM memory, DRAM memory, and nonvolatile memory (e.g., Flash, MRAM). 상기 메모리 어레이 회로들은 집적 회로(100) 또는 시스템 구현 회로(100)를 위한 메인 메모리, 캐시 메모리, 또는 부트 업 메모리로서 사용될 수 있다. The memory array circuits may be used as the integrated circuit 100 or the main memory for system implementation circuit 100, a cache memory, or the boot-up memory. 메모리 어레이 회로들(141, 151, 161)은 메모리 어레이의 결함 위치들에 대한 대체 위치들로서 리던던트 메모리 위치들(예를 들어, 행들, 열들, 블록들, 또는 비트들)을 구현하기 위한 퓨즈 정보를 사용한다. The memory array circuitry (141, 151, 161) is a fuse information for implementing the redundant memory locations (e.g., rows, in columns, block, or bit) as an alternative location for the fault location in the memory array use. 결함 메모리 어레이를 수리하기 위한 퓨즈 정보는 통상적으로 결함 열들 또는 행들을 식별하기 위한 인코딩된 어드레스들, 및 결함 열 또는 행이 리던던트 열 또는 행에 의해 대체되는 것을 가리키는 인에이블 신호를 포함한다. The fuse information for repairing the defective memory array typically includes an enable signal the encoded addresses and defective column or row for identifying faulty columns or rows points is replaced by the redundant column or row. 메모리 어레이 회로들은 메모리 셀들을 판독 또는 기입하기 위하여 요구된 다양한 타이밍 신호들을 제어하는 하나 또는 그 이상의 메모리 어레이들 및 제어 회로 내에 포함된 메모리 셀들을 포함한다. A memory array circuit comprise a memory cell included in the one or more memory arrays and a control circuit for controlling the various timing signals required to read or write the memory cells. 예로서, 이들 타이밍 신호들은 비트 라인 사전 충전, 워드 라인 지속기간, 감지 증폭기 인에이블, 감지 증폭기 사전 충전, 및 기입 지속기간의 타이밍 작용을 제어할 수 있다. By way of example, these timing signals may control the bit line pre-charging, the word line duration, the sense amplifier is enabled, the sense amplifier precharging and the write timing operation of the duration. 이들 동작 파라미터들 각각은 처리에 의해 이루어지고 퓨즈들을 사용하여 제조 후 잠재적으로 제어될 수 있다. Each of these operating parameters is made by the process can be controlled in potential after production using fuses. 메모리 어레이 회로들의 후제조 동작 파라미터 최적화를 위한 퓨즈들의 다른 가능한 사용들은 메모리 구성의 조절, 전력 절약 모드들, 기준 전압들, 감지 차동 전압들, 비트 라인 유지 세기들, 및 입력 또는 출력 래칭 구조들의 타이밍 제어를 포함한다. After of the memory array circuitry another possible use of the fuse for optimizing production operating parameters are the control of the memory structure, a power-save modes, the reference voltages, sensing the differential voltage of the bit line holding strength of, and the type or the timing of the output latching structure and a control. 몇몇 실시예들에서, 메모리 어레이 회로들의 단지 작은 부분만이 제어 회로의 후 제조 리던던시 기반 수리 또는 최적화를 요구하리라 생각된다. In some embodiments, only a small portion of the memory array circuit is thought will then control the circuit required for producing a redundancy-based repair or optimization. 따라서, 타이밍 신호들 및 전압 레벨들의 리던던시 기반 수리 및 최적화를 위한 용도에 속하기 때문에 특히 메모리 어레이 회로들에 걸쳐 퓨즈들의 융통성 있는 용도를 가지는 것은 매우 바람직하다. Thus, in particular having a flexibility in use of the fuse across the memory array circuit, because in the application for a redundancy-based repair and optimization of the timing signal and the voltage level is highly desirable. 각각의 메모리 어레이 회로(141, 151, 161)는 버스(121)로부터 퓨즈 정보를 수신하기 위하여 버스 인터페이스 유닛(BIU, 각각 143, 153, 163)을 포함한다. Each of the memory array circuit (141, 151, 161) includes a bus interface unit (BIU, respectively 143, 153, 163) to receive the fuse information from the bus 121. 시스템(101)은 버스(121)로부터 퓨즈 정보를 수신하기 위한 BIU(173)를 가진 위상 로킹 루프 회로(171)를 포함한다. System 101 includes a phase locked loop circuit (171) having a BIU (173) for receiving a fuse information from the bus 121. 회로(171)는 타이밍을 조절하고 위상 로킹 루프의 동작 파라미터들을 튜닝하기 위하여 수신된 퓨즈 정보를 사용하는 위상 로킹 루프(도시되지 않음)를 포함한다. The circuit 171 comprises a phase locked loop (not shown) that uses the received information to adjust the timing fuse and to tune the operating parameters of the phase locked loop. 상기 동작 파라미터들의 예들은 전압 제어 발진기 회로의 선택, 클럭 펄스 에지들 조절, 내부 용량들 조절, 필터 파라미터들 변형, 장치 컨덕턴스들 변화, 및 클럭 분할기 값들 정의를 포함한다. Examples of the operating parameters include the selection of the voltage-controlled oscillator circuit, the clock pulse edge adjustment, adjustment of the inner volume, filter parameters variation, the device conductance variations, and the clock divider values ​​defined. 시스템(101)은 버스(121)로부터 퓨즈 정보를 수신하기 위한 BIU(177)를 가진 클럭 분배 회로(715)를 포함한다. System 101 comprises a clock distribution circuit (715) having a BIU (177) for receiving a fuse information from the bus 121. 클럭 분배 회로(175)는 목표된 양의 지연을 가진 집적 회로(100)를 통해 분배된 클럭 생성기들을 프로그래밍하는 것과 같이 타이밍을 조절하고 파라미터들의 동작을 튜닝하기 위해 퓨즈 정보를 사용한다. Clock distribution circuit 175 controls the timing such as by programming the clock generator distributed over an integrated circuit 100 with the delay of the desired amount, and using the fuse information to tune the behavior of the parameters. 몇몇 실시예들에서, 클럭 생성기는 미리 결정된 지연 값들을 선택하게 하는 멀티플렉서를 포함한다. In some embodiments, the clock generator comprises a multiplexer for selecting the predetermined delay values. 적당한 지연 값은 멀티플렉서에 대한 선택 신호들을 선택함으로써 결정된다. Appropriate delay value is determined by selecting the select signal to the multiplexer. 이들 선택 값들은 퓨즈 정보를 사용하여 제조 후 제어될 수 있다. The selected value may be controlled after the production using the fuse information. 이러한 회로에 대한 퓨즈 정보의 다른 용도들은 기생 부하들의 변형 또는 장치 컨덕턴스들의 변형에 의한 클럭 트리들의 밸런싱을 포함한다. Other uses of the fuse information on this circuit include the balancing of the clock tree according to the modification of the modified device or conductance of parasitic load. 시스템(101)은 버스(121)로부터 퓨즈 정보를 수신하기 위한 BIU(125)를 가지는 아날로그 회로(123)를 포함한다. System 101 comprises an analog circuit 123 has a BIU (125) for receiving a fuse information from the bus 121. 아날로그 회로(123)는 퓨즈 정보로 프로그램할 수 있는 회로(예를 들어, 트림 가능한 캐패시터 및 레지스터들)를 가진 집적 회로(100)를 통해 분산된 아날로그 회로를 포함한다. The analog circuit 123 includes an analog circuit distributed over the integrated circuit 100 has a circuit that can be programmed with the fuse information (e. G., The trim resistor and a capacitor as possible). 상기 정보는 전압 레벨들 추적, 전압 레벨들 및 전류들의 크기, 저항 값들, 캐패시턴스 값들, 인덕턴스 값들, 및 아날로그 회로의 성능 또는 정밀도를 개선하기 위한 타이밍 지연들 같은 동작 파라미터들의 후제조 조절에 사용될 수 있다. The information is then of operating parameters such as the voltage level of the track, the voltage levels and currents of size, resistance values, capacitance values, and inductance values ​​and timing delay to improve the performance or accuracy of the analog circuit it can be used to produce control . 전압 조정기 회로(127)는 버스(121)로부터 퓨즈 정보를 수신하기 위하여 BIU(129)를 포함한다. The voltage regulator circuit 127 includes a BIU (129) to receive the fuse information from the bus 121. 전압 조정기 회로(127)는 하나 또는 그 이상의 전압 조정기들(도시되지 않음)을 포함할 수 있다. Voltage regulator circuit 127 may include one or more voltage regulators (not shown). 전압 조정기 회로(127)는 이들 조절기들에 의해 제공된 조절된 전압을 조절하기 위하여 퓨즈 정보를 사용한다. The voltage regulator circuit 127 uses the fuse information in order to control the voltage control provided by these controls. 일 실시예에서, 전압 조정기 회로(127)는 전압 조정기들에 제공된 기준 전압들을 조절하기 위 하여 퓨즈 정보를 사용한다. In one embodiment, voltage regulator circuit 127 uses the fuse information in order to control the reference voltage provided to the voltage regulator. 다른 실시예들에서, 전압 조정기 회로(127)는 안정성, 노이즈 면역, 및 정밀도의 개선을 위해 퓨즈 정보를 사용할 수 있다. In other embodiments, voltage regulator circuit 127 may be used to fuse the information to improve the reliability, noise immunity, and precision. 전력 관리 회로(131)는 버스(121)로부터 퓨즈 정보를 수신하기 위한 BIU(133)를 포함한다. Power management circuitry 131 includes a BIU (133) for receiving a fuse information from the bus 121. 전력 관리 회로(131)는 시스템 전력 소비를 제어하는 전력 관리 회로를 포함한다. Power management circuitry 131 includes a power management circuit for controlling a system power consumption. 통상적으로, 이것은 시스템 동작 전압, 시스템 주파수, 및 시스템 전력이 최소화되도록 동작 모드들을 변경하기 위한 능력의 제어를 포함한다. Typically, this includes the ability to control for changing the mode of operation to minimize the system operating voltage, system frequency, and system power. 이들 동작 파라미터들은 퓨즈 정보에 의한 제조 후 잠재적으로 변형될 수 있다. These operating parameters can be potentially modified in after manufacture by the fuse information. 디지털 논리 회로(135)는 버스(121)로부터 퓨즈 정보를 수신하기 위하여 BIU(137)를 포함한다. A digital logic circuit 135 and a BIU (137) to receive the fuse information from the bus 121. 디지털 논리 회로(135)는 퓨즈 정보로 프로그래밍할 수 있는 집적 회로(100)에 배치된 디지털 회로를 포함한다. A digital logic circuit 135 including a digital circuit arranged in an integrated circuit 100 that can be programmed with the fuse information. 상기 퓨즈 정보는 제조 후 회로의 동작 파라미터들을 변형하기 위해 사용될 수 있다. The fuse information can be used to modify operating parameters of the circuit after construction. 예를 들어, 퓨즈 정보는 제조 다음 동적 논리 블록들에서 키퍼 크기들의 선택적 조절 및 리던던트 논리로 결함 회로들의 후 제조 대체에 사용될 수 있다. For example, the fuse defect information is then of the circuit in the following Preparation dynamic logic block to selectively control and redundant logic of the keeper size can be used to produce alternative. 일 실시예에서, 퓨즈 정보는 제어기(113)의 프로그래밍 유닛(119)을 통해 제조 후 퓨즈 어레이 회로(103)에서 프로그래밍된다. In one embodiment, the fuse information is programmed in the fuse array circuit 103, and then prepared in the programming unit 119 of the controller 113. 일 실시예에서, 프로그래밍 유닛(119)은 검사 포트(106)를 통해 BIST 포트(108)를 사용하여 내부 BIST(Built-in Self-Test) 엔진들 또는 외부 제어 유닛에 결합된다. In one embodiment, the programming unit 119 is coupled with the inner BIST (Built-in Self-Test) engine or an external control unit by using the BIST port 108 through the inspection port 106. 결과적으로, 퓨즈 어레이 회로(103)의 프로그램 가능성 및 프로그래밍 유닛(119)을 제어하기 위한 다수의 가능한 방법들이 있다. As a result, there are a number of possible ways to control programmability and programming unit 119 of the fuse array circuit 103. 몇몇 실시예들에서, 시작(예를 들어, 리셋 전력 온) 동안, 퓨즈 어레이 회로(103)의 정보는 데이터 유닛 크기 증가분들(예를 들어, 2,4,8,12,14,16,24,32,64 비트들)의 유닛(117)을 전송함으로써 버스(121) 상에 제공된다. In some embodiments, during the start (e.g., a reset power-on), the information of the fuse circuit array 103 is, for those (for example, increased data unit size, 2,4,8,12,14,16,24 by sending unit 117, the bits 32,64) it is provided on the bus 121. 각각의 BIU는 식별 번호를 포함한다. Each BIU includes the identification number. 만약 식별 번호가 데이터 유닛 크기 증가분의 특정 식별자 분야와 매칭하면, BIU는 회로들의 구성들을 위해 그의 각각의 회로에 데이터 유닛의 나머지 부분의 퓨즈 정보를 제공한다. If the identification number is matched with a particular identifier field of the data unit size increment, BIU provides the fuse information in the remainder of the data units in their respective circuits to the configuration of the circuit. 다른 하나의 시간 프로그램 가능 장치 시스템들은 다른 구성들을 가질 수 있다. Other possible single time program device system can have different configurations. 예를 들어, 다른 퓨즈 시스템들은 다수의 퓨즈들을 포함할 수 있고 메모리 어레이 회로들은 하나의 버스이고 다른 회로들은 다른 버스들일 수 있다. For example, different fuse systems can include a plurality of fuses, and the memory array circuit are one bus and the other circuits may be a different bus. 상기 실시예에서, 제어기(113)는 부가적인 전송 유닛들(117)을 가질 수 있다. In the above embodiment, the controller 113 may have additional transmission units (117). 또한 다른 실시예들에서, 다른 타입들의 회로들 또는 다른 수의 회로 타입들은 퓨즈 시스템의 퓨즈 정보를 수신할 수 있다. In addition, in other embodiments, other circuits or other types of circuit type you can receive the fuse information from the fuse system. 예를 들면, 다른 퓨즈 시스템들은 20개 메모리 어레이 회로들을 포함할 수 있다. For example, different fuse systems may include 20 memory array circuit. 또한 다른 실시예들에서, 도 1에 도시된 다른 회로들은 BIU를 공유할 수 있다. In addition, in other embodiments, other circuits shown in Figure 1 may share the BIU. 예를 들어, 몇몇 실시예들에서, 전력 관리 회로(131) 및 전압 조정기 회로(127)는 동일한 BIU로부터 퓨즈 정보를 수신할 수 있다. For example, in some embodiments, the power management circuit 131 and a voltage regulator circuit 127 may receive information from the same fuse BIU. 또한 다른 실시예들에서, 제어기(113)는 퓨즈 어레이 회로(103)와 유사한 부가적인 퓨즈 어레이들에 결합될 수 있다. In addition, in other embodiments, controller 113 may be coupled to additional fuse array similar to the array of fuse circuit 103. 또한, 다른 실시예들에서, 집적 회로(100)는 퓨즈 시스템(101)과 유사한 다중 퓨즈 시스템들을 포함할 수 있다. Further, in other embodiments, the integrated circuit 100 may include multiple fuse system is similar to the fuse system 101. 도 2는 위상 로킹 루프 회로(171)의 블록도이다. Figure 2 is a block diagram of a phase locked loop circuit 171. 도 2에 도시된 바와 같이, 회로(171)는 위상 로킹 루프(227) 및 구성 유닛(225)을 포함한다. As shown in Figure 2, the circuit 171 comprises a phase locked loop 227 and the configuration unit 225. 유닛(225)은 전 압 제어 발진기 회로의 선택, 클럭 펄스 에지들의 조절, 내부 캐패시턴스들 조절, 필터 파라미터들 변형, 장치 컨덕턴스들 변경, 및 클럭 분할기 값들의 정의를 위한 위상 로킹 루프(227), 또는 튜닝 또는 타이밍을 조절하는 것과 관련된 임의의 다른 동작 파라미터를 구성한다. Unit 225 is controlled by the voltage controlled oscillator circuit selection of a clock pulse edge, the internal capacitance of the control, the filter parameter of variation, the device conductance of change, and the clock phase locked loop 227 for a definition of a divider value, or constitute any other operating parameters associated with tuning or adjusting the timing. 일 실시예에서, 유닛(225)은 라인들(223)을 통해 BIU(173)의 레지스터들(213, 215, 217, 219)의 출력들에 의해 제어되는 하나 또는 그 이상의 통과 게이트들 또는 다른 스위치들을 포함할 수 있다. In one embodiment, the unit 225 are lines 223 to the register of the BIU (173) passes through one or more of which is controlled by the output of the (213, 215, 217, 219) gates or other switch via It may contain. 도시된 실시예에서, 버스(121)는 14 비트 폭 버스이다. In the illustrated embodiment, bus 121 is a 14 bit wide bus. 버스의 4개의 비트 라인들(201)은 BIU(173)의 ID 매칭 회로(207)에 접속된다. The four bit lines of bus 201 is connected to the ID matching circuit 207 of the BIU (173). 두 개의 라인들(203)은 BIU(173)의 레지스터 제어 회로(211)에 접속된다. Two lines 203 are connected to the register control circuit 211 of the BIU (173). 8개의 나머지 라인들(205)은 8 비트 데이터 레지스터들(213, 215, 217, 219) 각각에 접속된다. Of the eight remaining lines 205 are connected to the 8-bit data registers (213, 215, 217, 219), respectively. 도시된 실시예에서, 버스(121)는 병렬 디지털 버스이다. In the illustrated embodiment, bus 121 is a parallel digital bus. 그러나, 다른 실시예들에서, 버스(121)는 다른 구성들, 예를 들어, 직렬, 차동 구성들을 가질 수 있다. However, in other embodiments, bus 121 may have other configurations, for example, in series, a differential configuration. 도시된 실시예에서, 레지스터들(213, 215, 217, 219)의 각각의 레지스터 위치는 32 비트 구성 유닛(225)을 제어하기 위한 구성 가능한 정보 비트를 나타낸다. In the illustrated embodiment, each register location of the register (213, 215, 217, 219) represents the configurable information bits to control the 32-bit configuration unit 225. 일 실시예에서, 레지스터들(213, 215, 217, 219)의 각각의 비트는 디폴트 값을 포함한다. In one embodiment, each bit of the register (213, 215, 217, 219) comprises a default value. 만약 퓨즈 정보가 레지스터에 대하여 BIU(173)에 의해 수신되지 않으면, 레지스터들(213, 215, 217, 219)은 디폴트 값들을 유닛(225)에 제공한다. If the fuse information is received by the BIU (173) with respect to the register, the register (213, 215, 217, 219) provides the default value of the unit 225. 레지스터(213, 215, 217, 219)가 퓨즈 정보로 프로그래밍될 때, 퓨즈 정보는 디폴트 값들 대신 유닛(225)에 제공된다. When the register (213, 215, 217, 219) to be programmed to the fuse information, the fuse information is provided in place of the default values, unit (225). 따라서, 몇몇 실시예들에서, 단지 하나 또는 두 개의 비트들의 레지스터들(213)은 프로그래밍될 필요가 있다. Thus, in some embodiments, the registers of only one or two bit 213 needs to be programmed. 상기 경우, 하나 또는 두 개의 비트들을 포함하는 이들 레지스터들(213, 215, 217, 219)은 퓨즈 정보로 기입된다. In such a case, one or the contents of these registers comprises two bits (213, 215, 217, 219) is written in the fuse information. 레지스터들(213, 215, 217, 219) 중 다른 비기입된 레지스터들은 디폴트 값들을 제공한다. Of the registers (213, 215, 217, 219) other non-writing the registers and provides the default value. 종래 기술 시스템들에서, PLL 회로(171)는 32 퓨즈들을 요구하고, 상기 퓨즈들은 레지스터들(213, 215, 217, 219)의 비트 각각에 대한 것이다. In prior art systems, PLL circuit 171 requires the fuse 32 and the fuse are for each bit of the register (213, 215, 217, 219). 상기 시스템들에서, 만약 단지 하나의 비트가 조절될 필요가 있으면, 다른 31 퓨즈들은 사용되지 않는다. If in the above system, if the need be only a single bit is adjusted, the other fuse 31 are not used. 그러나, 여기에 기술된 실시예들에서, 조절될 비트를 가진 레지스터(213, 215, 217, 219)가 기입된다. However, in the embodiments shown herein, it is written with a bit to be control register (213, 215, 217, 219). 따라서, 퓨즈 어레이 회로(103)의 단지 14 퓨즈들(데이터에 대해 8 퓨즈들, ID 매칭 식별기에 대해 4개의 퓨즈들, 및 레지스터 제어 회로(211)에 대한 라인들(203)에 제공된 정보를 위한 두 개의 퓨즈들)은 위상 로킹 루프(227)를 프로그래밍하기 위해 필요하다. Therefore, the fuse array circuit 103, only 14 fuse with (for data 8 fuses with, ID matching the four fuses for the identifier, and a register control circuit 211 for the information provided on lines 203 to the two fuse) is required to program the phase locked loop (227). 상기 실시예에 의해 도시된 바와 같이, 도 1의 퓨즈 시스템은 제어기(113)에 결합된 회로들에 의해 공유될 퓨즈 어레이 회로(103)의 퓨즈들을 인에이블한다. As illustrated by the above embodiments, also it enables the fuses in the fuse array circuit 103 is shared by the circuitry coupled to the fuse system 1 controller 113. 도 1의 시스템에서, 퓨즈는 필요할 때 임의의 회로에 할당될 수 있다. In the system of Figure 1, the fuse may be assigned to any circuit when needed. 따라서, 집적 회로(100)를 프로그래밍하기 위해 필요한 퓨즈들의 수는 종래 기술 퓨즈 구현 방법들에 비해 감소될 수 있다. Therefore, the number of fuses required to program the integrated circuit 100 can be reduced compared with the prior art fuse implementation. 다른 실시예들은 다른 수의 버스(121) 라인들을 포함할 수 있다. Other embodiments may include a different number of bus 121 lines. 또한, 다른 실시예들은 라인들(201,203, 및/또는 205)에 대한 다른 수의 라인들을 포함할 수 있다. In addition, other embodiments may include a different number of lines for the line (201 203, and / or 205). 게다가, 다른 실시예들은 퓨즈 정보를 사용하여 회로를 프로그래밍하기 위한 다른 회로를 구현할 수 있다. In addition, other embodiments may implement other circuit for programming the circuit using a fuse information. 도 3은 수리 가능한 메모리 어레이 회로(141)의 블록도이다. Figure 3 is a block diagram of a repairable memory array circuit 141. 메모리 어레이 회로(141)는 정보를 저장하기 위한 메모리 셀들(301)의 어레이를 포함한다. The memory array circuit 141 includes an array of memory cells 301 for storing information. 어레이(301)의 정보는 제어 논리(309) 및 감지 증폭기(307)에 어드레스들을 제공함으로써 메모리 어레이(301)에 기입 및 그로부터 판독된다. Information of the array 301 is written to and read from the memory array 301 by supplying an address to the control logic 309 and a sense amplifier 307. The 메모리 어레이 회로(141)는 리던던트 셀들을 포함하고, 도시된 실시예에서 리던던트 컬럼(305) 및 리던던트 로우(303)로서 구현되지만, 다른 실시예들에서 다른 구성들로 구현될 수 있기 때문에 수리할 수 있다. A memory array circuit 141 includes a redundant cell, and are implemented as redundant columns 305 and redundant row 303. In the embodiment shown, the serviceable because they can be implemented in other embodiments with different configurations have. 예를 들어, 리던던트 셀들은 제 2 어레이로 구현될 수 있다. For example, redundant cells can be implemented in a second array. 회로(141)는 어레이(301)의 컬럼이 리던던트 컬럼(305)으로 대체되고 어레이(301)의 로우가 리던던트 로우(303)로 대체되는 것을 결정하기 위한 리던던시 논리(311)를 포함한다. The circuit 141 comprises a redundancy logic 311 for determining that the rows of the array 301, the column is replaced by the redundant column 305, an array 301 of which is replaced with a redundant row 303. 일 실시예에서, 리던던시 논리(311)는 로우 수리 데이터 레지스터(321) 및 컬럼 수리 데이터 레지스터(323)의 정보에 의해 제어되는 통과 게이트들 또는 다른 타입의 스위치들을 포함한다. In one embodiment, the redundancy logic 311 comprises a row repair data register 321 and a column repair data pass is controlled by the information of the register 323, gate or other type of switch. 이들 스위치들은 어레이(301)의 결함 로우 또는 컬럼에 대한 어드레스들이 리던던트 로우 또는 컬럼에 액세스하도록 제어된다. These switches are controlled so that the address to access the redundant row or column of the defective row or column in the array 301. 일 실시예에서, 리던던트 로우(303)는 레지스터(321)에 기입된 퓨즈 정보에 의해 식별된 어레이(301)의 로우를 대체한다. In one embodiment, a redundant row 303 is to replace a row of the array (301) identified by the fuse information written in the register 321. 리던던트 컬럼(305)은 레지스터(323)에 기입된 퓨즈 정보에 의해 식별된 어레이(301)의 컬럼을 대체한다. The redundant column 305 is to replace a column of the array (301) identified by the fuse information written in the register 323. 만약 퓨즈 정보가 레지스터들(321, 323)에 기입되지 않으면, 그의 레지스터들은 대체가 필요하지 않다는 것을 가리키는 디폴트 값들을 제공할 것이다. If the fuse information is not written to the registers 321 and 323, its register will provide the default values ​​indicating that replacement is not necessary. 메모리 어레이 회로에서 리던던트 셀들의 사용을 프로그래밍하기 위해 사용된 퓨즈 정보는 리던던시 정보 타입이다. The fuse information used to program the use of a redundant cell in a memory array is a redundancy circuit type information. 메모리 어레이 회로(141)의 동작 파라미터들은 또한 버스(121) 상에 수신된 퓨즈 정보에 의해 조절될 수 있다. The operating parameters of the memory array circuit 141 may also be controlled by a fuse information received on bus 121. 예로서, 타이밍 신호들은 비트 라인 사전 충전, 워드 라인 지속 기간, 감지 증폭기 인에이블, 감지 증폭기 사전 충전, 및 기입 지속기간의 타이밍 작용을 제어하기 위해 조절될 수 있다. By way of example, timing signals may be adjusted to control the bit line pre-charging, the word line duration, the sense amplifier is enabled, the sense amplifier timing action of the pre-charge, and the writing duration. 이들 작용들 각각은 처리에 의해 영향을 받고 퓨즈들을 사용하여 제조 후 잠재적으로 제어될 수 있다. Each of these action is affected by the treatment can be controlled in potential after production using fuses. 메모리 회로(141)의 후 제조 동작 파라미터 최적화를 위한 퓨즈들의 다른 가능한 용도들은 메모리 구성, 전력 절약 모드들, 기준 전압들, 감지 차동 전압들, 비트 라인 키퍼 세기들, 및 입력 또는 출력 래칭 구조들의 타이밍 제어의 조절을 포함한다. Other possible uses of fuses for optimizing production operating parameters after the memory circuit 141 are the memory configuration, the power-save modes, the reference voltages, sensing a differential voltage, bit line keeper intensity of, and the type or the timing of the output latching structure It includes adjustment of the control. 이들 파라미터들은 목표된 메모리 동작 성능이 달성되도록 예기되지 않은 설계 마진들 또는 예상되지 않은 처리 변수를 수정하기 위해 조절될 수 있다. These parameters may be adjusted to modify the design margins, or processing that is not expected variables are not expected to achieve the desired memory operation performance. 이들 조절들은 레지스터(325 또는 327) 중 하나에 퓨즈 정보를 기입함으로써 이루어진다. These adjustment are made by writing the fuse information in one of the registers (325 or 327). 튜닝 레지스터들(325, 327)의 정보는 파라미터들이 조절되는 것을 제어한다. Information of the tuning resistor (325, 327) controls that the parameters are adjustable. 레지스터들(325, 327) 각각은 퓨즈 정보가 이들 레지스터들에 기입되지 않으면 디폴트 값들을 제공한다. Registers (325, 327) each of which, if the fuse information is written to these registers and provides the default value. BIU(143)는 라인들(331)을 통해 4개의 라인들의 퓨즈 정보를 수신하는 ID 매칭 회로(317)를 포함한다. The BIU (143) includes ID matching circuit 317 for receiving a fuse information of 4 lines through lines 331. 레지스터 제어 회로(319)는 라인들(333)을 통해 2 비트의 퓨즈 정보를 수신한다. Register control circuit 319 receives the fuse two bits of information over the lines 333. 레지스터들(321, 323, 325, 327) 각각은 버스(121)로부터 8 비트의 정보를 수신하기 위해 라인들(335)에 접속된다. Each of the registers (321, 323, 325, 327) are connected to lines 335 for receiving information from an 8-bit bus 121. ID 매칭 회로(317) 및 레지스터 제어 회로(319)는 ID 매칭 회로(207) 및 레지스터 제어 회로(211)가 레지스터들(213, 215, 217, 219)에 정보를 기입하기 위해 동작할 때 라인들(335)로부터 레지스터들(321, 323, 325, 327) 중 하나로 퓨즈 정보를 기입하기 위하여 유사한 방식으로 동작한다. ID matching circuit 317 and the register control circuit 319 is the line when the ID matching circuit 207 and the register control circuit 211 is operable to write information to the register (213, 215, 217, 219) in order to enter the fuse information into one of the registers from a 335 (321, 323, 325, 327) it operates in a similar manner. 도시된 실시예에서, 퓨즈 어레이 회로(103)의 퓨즈 정보는 메모리 어레이(301)의 로우 및 컬럼 둘 다를 수리하기 위해 사용될 수 있다. In the illustrated embodiment, the fuse information from the fuse array circuit 103 may be used to repair both the row and column of the memory array 301. 일 실시예에서, 제 1 퓨즈 데이터 유닛은 레지스터(321)에 결함 로우의 표시를 기입하기 위하여 유닛(117)에 의해 버스(121) 상에 제공한다. In one embodiment, the first fuse data unit provided on the bus 121 by a unit 117 to fill the display of the defective rows in the register 321. 상기 데이터 유닛은 퓨즈 정보가 메모리 어레이 회로(141)를 위한 것을 가리키는 ID 식별자를 라인들(331)에 포함한다. The data unit includes an identifier ID indicating that for the memory array circuitry 141, fuse information on lines 331. 버스(121)상 정보는 레지스터(321)가 라인들(335)로부터 퓨즈 정보로 기입되는 것을 가리키는 값들을 라인들(333) 상에 포함한다. A bus (121) information comprises a value indicating that the register 321 is written into the fuse information from the lines 335 on lines 333. 퓨즈 정보의 다른 데이터 유닛은 퓨즈 정보가 메모리 어레이 회로(141) 및 컬럼 수리 레지스터(323)를 위한 것인 것 을 가리키는 버스(121)상에 추후 배치된다. Other data units of the fuse information is arranged further on the bus 121 will be pointing to the fuse information is intended for the memory array circuit 141 and a column repair register 323. 메모리 동작 파라미터들이 튜닝될 필요가 있을 때, 튜닝 레지스터들(325, 327)은 레지스터들(321, 323)과 유사한 방식으로 기입될 수 있다. When there is to be a memory the operating parameters are tuned, the tuning resistor (325, 327) it can be written in a manner similar to the registers 321 and 323. 만약 프로그래밍이 시작 동안 메모리 어레이 회로(141)에 필요하지 않으면, 레지스터들(321, 323, 324, 또는 327) 중 어느 것도 퓨즈 정보로 기입되지 않는다. If programming is not needed in the memory array circuit (141) for starting, but none of the register (321, 323, 324, or 327), nothing is written in the fuse information. 따라서, 이들 레지스터들은 디폴트 값들을 제공한다. Therefore, these registers provide the default values. 종래 기술 집적 회로들과 반대로, 도 3의 실시예에서, 리던던시 수리 및 비 리던던시 수리 퓨즈 정보 둘 모두는 메모리 어레이 회로(141)에 제공될 수 있다. Both the prior art integrated circuits, as opposed to in the embodiment of Figure 3, the redundancy repair and non-redundancy fuse repair information can be provided to the memory array circuit 141. 이것은 퓨즈들이 특정 메모리 회로의 리던던시 수리 및 비리던던시 수리 정보(예를 들어, 타이밍 및 튜닝 정보)를 위하여 공유되도록 하는 것뿐 아니라, 퓨즈 어레이가 집적 회로의 메모리 어레이 회로들 및 다른 비메모리 어레이 회로들(회로들 123, 127, 131, 135, 175, 171) 사이에 사용되게 한다. This fuse to the well as to be shared to a redundancy repair and non-redundancy repair information (e.g., timing and tuning information) of a particular memory circuit, the fuse array is an integrated circuit of memory array circuits and other non-memory array circuitry to be used between (circuits 123, 127, 131, 135, 175, 171). 메모리 어레이 및 비메모리 어레이 회로들 사이에서 퓨즈들(또는 다른 타입의 OTP 엘리먼트들)을 "공유"하기 위한 이런 능력은 퓨즈 구현시 융통성을 제공할 수 있다. A memory array and a non-memory array circuit of this ability to "shared" with a fuse (or OTP elements of other type) between may provide flexibility in implementation fuse. 상기 융통성은 퓨즈 용도가 공유될 수 없는 종래 기술 시스템들에 비해 필요한 퓨즈들의 수를 궁극적으로 감소킬 수 있다. The flexibility may ultimately reduce the number of fuses required skill than prior art systems that do not use the fuse can be shared. 이것은 집적 회로들의 트랜지스터 피쳐 크기의 크기 감소와 거의 동일한 비율로 퓨즈 크기 감소가 진척되지 않기 때문에 퓨즈들을 사용하는 시스템들에 특히 중요하다. This is particularly important in systems using integrated fuse because it does reduce the circuit size of the transistor feature size and nearly the same rate of fuse size reduction not progress. 다른 실시예들에서, 각각의 메모리 회로는 다중 BIU들을 포함할 수 있다. In other embodiments, each of the memory circuit may comprise multiple BIU. 예를 들어, 하나의 BIU는 리던던시 퓨즈 정보를 수신하기 위해 사용될 수 있고, 다 른 BIU는 비 리던던시(예를 들어, 타이밍, 튜닝) 정보를 수신하기 위해 사용될 수 있다. For example, one BIU may be used to receive the redundancy fuse information, other BIU may be used to receive non-redundant (e. G., Timing, tuning) information. 도 4는 클럭 분배 회로(175)의 일 실시예의 블록도를 도시한다. Figure 4 illustrates a block diagram of one embodiment of a clock distribution circuit (175). 클럭 분배 회로(175)는 집적 회로(100) 도처에 배치된 다수의 클럭 재생 회로들(409, 421, 423, 425, 427)을 포함한다. Clock distribution circuit 175 includes a plurality of clock recovery circuits (409, 421, 423, 425, 427) disposed around the integrated circuit 100. 클럭 재생 회로(175)는 집적 회로(100)의 다양한 위치들에서 클럭 신호를 프로그램 가능하게 지연하기 위한 능력을 집적 회로(100)에 제공한다. Clock generation circuit 175 provides the capability to delay the clock signal to enable the program in the various positions of the integrated circuit 100 to integrated circuit 100. 클럭 재생 회로(409)는 멀티플렉서(419) 및 상기 멀티플렉서(419)의 입력에 각각 결합된 4개의 다른 지연 엘리먼트들(D1, D2, D3, D4)을 포함한다. Clock recovery circuit 409 includes a multiplexer 419 and to the four different delay elements each coupled to an input of the multiplexer 419 (D1, D2, D3, D4). 각각의 지연 엘리먼트는 클럭 입력에 결합된다. Each delay element is coupled to the clock input. 4개의 지연 엘리먼트들 각각은 다른 지연 길이를 가진다. Each of the four delay elements has a different delay length. 어느 멀티플렉서(419)의 입력이 선택되느냐에 따라, 클럭 아웃(1)은 다른 지연을 가진 클럭 신호를 제공한다. Depending on whether either the input of the multiplexer 419 selected, the clock out (1) provides a clock signal having a different delay. 회로들(421, 423, 425, 427)은 회로(409)와 유사한 방식으로 구성된다. The circuit (421, 423, 425, 427) is configured in a manner similar to the circuit 409. 각각의 재생 회로(409, 421, 423, 425, 427)의 멀티플렉서 선택 입력은 10 비트 튜닝 레지스터(403) 중 두 개의 비트들에 결합된다. The multiplexer select input of each of the reproducing circuit (409, 421, 423, 425, 427) are coupled to the two bits of the 10 bit tuning resistor 403. 따라서, 각각의 클럭 생성 회로에 의해 제공된 지연은 BIU(177)의 레지스터(403)에 퓨즈 정보를 기입하여 프로그래밍할 수 있다. Therefore, the delay provided by each of the clock generating circuit may be programmed to enter the fuse information in the register 403 of the BIU (177). 일 실시예에서, 만약 퓨즈 정보가 레지스터(403)에 기입되지 않으면, 레지스터(403)는 디폴트 값들을 제공할 것이다. In one embodiment, If the fuse information is written to the register 403, the register 403 will provide the default values. BIU(177)는 레지스터 제어 회로(211, 319)를 포함하지 않는 BIU들(143, 173)과 다르다. BIU (177) is different from the BIU does not include a register control circuit (211, 319, 143, 173). 따라서, 도시된 실시예에서, BIU들(143, 173)을 가진 레지스터 제어 회로들(211, 319)에 제공된 2 비트의 퓨즈 정보는 구성 회로들을 위한 프로그래밍 데이터로서 사용될 수 있다. Thus, in the illustrated embodiment, the fuse information in the two-bit register provided in the control circuit with the BIU (143, 173) (211, 319) may be used as the programming data for the circuit configuration. 따라서, 레지스터(403)는 10 비트인 반면 BIU(143) 및 BIU(173)의 레지스터들은 8 비트이다. Thus, the register 403 is an 8-bit registers are 10-bit, while the BIU (143) and a BIU (173). 레지스터(403)에 대한 기입은 ID 매칭 회로(401)에 의해 제어된다. Writing to register 403 is controlled by the ID matching circuit 401. 따라서, 도시된 실시예에서, 시스템은 BIU가 어떻게 구현되는가에 따라 제어기(113)에 의해 제공된 동일한 길이 데이터 유닛들이 다른 크기들의 프로그래밍 정보를 포함할 수 있는 경우 구현될 수 있다. Thus, in the illustrated embodiment, the system can be implemented, if capable of the same length data units including the programming information of the different sizes provided by the controller 113 depending on how the BIU implementation. 도 5는 퓨즈 어레이 회로(103)의 블록도를 도시한다. Figure 5 illustrates a block diagram of a fuse array circuit 103. 퓨즈 어레이 회로(103)는 퓨즈 뱅크들(105, 107, 111)을 가진 다수의 퓨즈 뱅크들을 포함한다. Fuse array circuit 103 includes a plurality of fuse banks with the fuse bank (105, 107, 111). 도시된 실시예에서, 각각의 퓨즈 뱅크는 14 퓨즈들(F0-F13)의 퓨즈 어레이(510)를 포함한다. In the illustrated embodiment, each fuse bank comprises a fuse array 510 of the fuse 14 (F0-F13). 각각의 퓨즈 뱅크는 각각의 어레이의 퓨즈 상태를 결정하기 위하여 퓨즈 검출 회로(512)를 포함한다. Each fuse bank comprises a fuse detect circuit 512 to determine a fuse state for each array. 각각의 뱅크의 퓨즈 검출 회로(512)는 퓨즈 뱅크 선택기(507)에 결합된다. Fuse detection circuit 512 of each of the banks is coupled to a fuse bank selector 507. 퓨즈 뱅크 선택기(507)는 각각의 뱅크로부터 퓨즈 정보를 판독하기 위해 사용된다. Fuse bank selector 507 is used for reading the fuse information from each of the banks. 일 실시예에서, 선택기(507)는 제어 라인들(112)상 퓨즈 뱅크 어드레스를 수신한 것에 응답하여 데이터 라인들(114)상 뱅크로부터 14 비트들을 제공한다. In one embodiment, the selector 507 provides control lines 112 to the fuse bank address in response to receiving a data line of 14 bits from the 114-phase bank. 퓨즈 어레이 회로(103)는 또한 퓨즈 뱅크들의 퓨즈들을 프로그래밍하기 위한 프로그래밍 제어기(501)를 포함한다. Fuse array circuit 103 further includes a programming controller 501 for programming the fuse of the fuse bank. 퓨즈 어레이 회로(103)는 또한 퓨즈 뱅크들의 퓨즈들 상태를 검출하는 퓨즈 검출 회로들(512)을 제어하는 검출 회로 제어기(503)를 포함한다. Fuse array circuit 103 further includes a detection circuit controller 503 that controls the fuse detecting circuits (512) for detecting the state of the fuse the fuse bank. 다른 실시예들에서, 퓨즈 어레이 회로는 다른 구성들을 가질 수 있다. In other embodiments, the fuse array circuitry may have other configurations. 또한, 여기서 다른 타입들의 OTP 엘리먼트들(예를 들어, PROM 셀들)이 사용되는 경우, 이들 엘리먼트들을 구현하는 회로들은 다른 구성들을 가질 수 있다. Further, here, if the OTP elements of different types (e.g., PROM cells) is used, a circuit for implementing these elements may have different configurations. 일 실시예에서, 리셋 전력 온 중에, 제어기(113)는 제어 라인들(112)상 퓨즈 뱅크의 어드레스를 제공함으로써 각각의 퓨즈 뱅크로부터 정보를 판독하고, 여기서 퓨즈 뱅크에 저장된 퓨즈 정보는 데이터 라인들(114) 상에 제공된다. In one embodiment, the reset power-on, the controller 113 has control lines 112 by providing addresses of the fuse bank to read information from each fuse bank, in which the fuse information stored in the fuse bank has a data line is provided on the (114). 그 다음 제어기(113)의 유닛(117)은 14 비트 데이터 유닛으로서 버스(121)상 퓨즈 정보를 제공한다. The unit 117 of the next controller 113 provides the fuse information bus 121 as 14-bit data units. 버스(121)상 회로의 BIU의 각각의 ID 매칭 회로는 그의 버스 유일한 ID와 매칭하는 데이터 유닛의 ID 필드를 찾는다. Bus 121. Each of the ID matching circuit of the BIU of the circuit finds the ID field of the data unit that matches the bus only his ID. 만약 BIU가 매칭을 발견하면, 버스상 퓨즈 정보는 BIU의 레지스터들에 로딩된다. If the BIU finds a match, bus the fuse information is loaded to the register of the BIU. 제어기(113)는 퓨즈 정보 모두가 버스(121) 상에 제공될 때까지 정보를 제공하는 것을 유지한다. The controller 113 is maintained to provide the information until all of the fuse information to be provided on the bus 121. 다른 실시예들에서, 다른 제어기들은 다른 방법들에 의해 버스상 회로들에 퓨즈 정보를 제공할 수 있다. In other embodiments, other controllers may be provided a fuse information to the bus circuits by other methods. 도 6은 어레이 회로(103)의 다른 퓨즈 뱅크들에 저장될 수 있는 정보의 다른 필드들을 도시한다. Figure 6 illustrates the different fields of information that can be stored in another fuse bank in the array circuit 103. The 도 6에 도시된 바와 같이, 시스템은 다른 회로들을 프로그래밍하기 위한 다른 길이들의 데이터 프로그래밍 필드들을 가지는데 융통성을 제공한다. 6, the system provides the flexibility of the I data of the other field programmable length to program the other circuit. 각각의 필드들(601, 603, 605, 607, 608)은 정보가 기입될 버스(121)상 회로를 식별하기 위해 사용된 식별자를 가진 ID 서브 필드를 포함한다. Each of the fields (601, 603, 605, 607, 608) includes a sub ID field with an identifier used for identifying the information bus 121 a circuit to be written. 따라서, 어레이(103)의 임의의 뱅크는 ID 필드의 버스 유일 ID(또는 다중 버스 시스템들에서 시 스템 유일 ID 데이터)를 프로그래밍함으로써 시스템(101)의 임의의 회로에 사용될 수 있다. Thus, any of the banks of the array 103 may be used in any circuit in the system 101 by programming the (unique ID data from the system, or a multi-system bus) bus unique ID of the ID field. 다수의 다른 회로들에 의해 뱅크를 사용하기 위한 이런 능력은 사용되는 퓨즈들의 총수를 감소시키기 위한 융통성을 회로에 제공한다. This ability to use a bank by a number of different circuit provides the flexibility to reduce the total number of fuses used in the circuit. 필드(601)는 비교적 큰 수의 컬럼들 및 로우들을 가진 큰 메모리 어레이 회로를 프로그래밍하기 위하여 사용될 수 있다. Field 601 may be used to program a large memory array circuit having a relatively large number of columns and rows of. 예를 들어, 큰 메모리 어레이 회로는 도 3에 도시된 메모리 어레이 회로(141)와 유사할 수 있다. For example, a large memory array circuit may be similar to the memory array circuit 141 shown in Fig. 상기 메모리 어레이 회로에서, 리던던시 수리 정보는 큰 어드레스로 인해 비교적 큰 필드일 필요가 있다. In the memory array circuit, a redundancy repair information may have to be relatively large field due to a large address. 필드(601)는 리던던시 수리 정보가 로우를 위한 것인지 컬럼을 위한 것인지 설계하기 위하여 선택 서브필드를 포함한다. The field 601 includes a sub-field to select the redundancy repair information to design whether for a column for low-what. 대조하여, 필드(603)는 보다 작은 수의 로우들 및 컬럼들을 가진 비교적 작은 메모리 어레이 회로에 사용된다. In contrast, field 603 is used for more than a relatively small memory array circuit having rows and columns of a smaller number. 이런 메모리 어레이 회로에서, 두 개의 다른 데이터 필드들(예를 들어, 리던던트 로우 및 리던던트 컬럼)은 하나의 퓨즈 데이터 유닛으로 전송될 수 있다. In this memory array circuit, the two different data fields (e.g., the redundant rows and redundant columns) can be transmitted as one data fuse unit. 필드(603)는 선택 필드를 포함하지 않는다. Field 603 does not contain an optional field. 선택적으로, 필드(603)는 두 개의 별개의 메모리 어레이 회로들에 대한 수리 정보를 포함할 수 있다. Alternatively, the field 603 may include service information for two separate memory array circuit. 플드(605)는 클럭 분배 회로(예를 들어, 회로 175)에 대한 퓨즈 정보를 도시한다. Peuldeu 605 shows a fuse information for the clock distribution circuit (e.g., circuit 175). 이 실시예에서, 각각의 클럭 재생 필드는 특정 서브필드(예를 들어, CR1,CR2)로 프로그래밍된다. In this embodiment, each clock regeneration field is programmed with a specific subfield (e.g., CR1, CR2). 필드(607)는 PLL 회로(171)에 대한 레지스터 선택 및 타이밍 정보를 포함한다. The field 607 is a register selection, and timing information for the PLL circuit 171. 필드(608)는 메모리 어레이 회로를 프로그래밍하기 위해 사용된다. Field 608 is used to program the memory array circuit. 필드(608)는 리던던시 수리 정보를 위한 서브 필드 및 정보를 튜닝하기 위한 서브필 드를 포함한다. The field 608 includes a sub-field to tune the sub-fields, and information for the redundancy repair information. 필드(608)는 리던던시 및 비리던던시 정보가 버스(121)상에서 하나의 데이터 유닛씩 제공될 수 있는 예를 나타낸다. Field 608 shows an example in which the redundant and non-redundant information can be provided by a single data unit on the bus 121. 도 7은 집적 회로의 퓨즈들을 설계, 제조, 검사, 및 프로그래밍하는 동작들을 기술하는 흐름도이다. 7 is a flow chart describing the design, manufacturing, testing, programming and operation of the fuse of the integrated circuit. 동작(701)에서, 설계 동안, 구성 회로를 가진 각각의 회로는 버스(121)에 결합되도록 설계되고 버스 유일 또는 버스 유일 식별 필드가 할당된다. In operation 701, during the design, each circuit having a circuit arrangement is designed to be coupled to bus 121 is assigned a unique bus or bus only identification field. 이후, 각각의 회로의 매칭 ID 회로들(예를 들어, 207,317 및 401)은 버스(121)상에서 전송된 유일한 ID 회로를 인식하도록 설계된다. Then, the ID matching circuits of the respective circuit (e.g., 207 317 and 401) are designed to recognize only the transferred ID circuit on the bus 121. 동작(703)에서, 집적 회로는 설계에 따라 제조된다. In operation 703, the integrated circuit is made according to the design. 일 실시예에서, 집적 회로는 반도체 처리들을 사용하여 제조된다. In one embodiment, the integrated circuit is fabricated using semiconductor processing. 집적 회로는 프로그래밍되지 않은 상태의 퓨즈들로 제조된다. The integrated circuit is made of the fuse in the non-programmed state. 동작(705)시, 집적 회로는 임의의 구성 가능 회로들의 구성이 필요한지 또는 요구되는지를 결정하기 위해 검사된다. Operation 705, when the integrated circuit is checked to determine if the required configuration of any of the configurable circuit or required. 일 실시예에서, 메모리 어레이들은 결함 셀들, 결함 컬럼들, 결함 어레이들, 또는 결함 블록들에 대해 검사된다. In one embodiment, the memory array are scanned for the defective cells, the column defect, the defective array, or a defective block. 또한, 다양한 검사들은 집적 회로상 다른 블록들의 기능 및 강건성을 결정하기 위하여 수행된다. In addition, various tests are performed to determine the capabilities and robustness of integrated circuits on another block. 이들은 전압 조정기 출력, 전력 소비, PLL 지터, PLL 주파수, 클럭 스큐 특성, 아날로그 출력 레벨들, 및 기능 패턴 성능에 따른 주파수/전압을 측정하는 것을 포함할 수 있다(하지만 이것으로 제한되지 않는다). These may include measuring a frequency / voltage according to the voltage regulator output, power consumption, jitter PLL, PLL frequency, clock skew characteristics of the analog output level, and feature pattern performance (but not limited thereto). 동작(707)시, 리던던시 및 비리던던시 정보를 가진 퓨즈들을 프로그래밍하기 위한 솔루션은 개발된다. Operation 707 solution for programming the fuse with the city, redundant and non-redundant information are developed. 이 솔루션은 동작(705)시 검사 결과들에 기초한다. The solution is based on the operation unit 705 during the inspection result. 일 실시예에서, 프로그래밍을 요구하는 비트들을 가진 BIU들의 각각의 레지스터들이 식별된다. In one embodiment, each register of the BIU are identified with the bits that require programming. 정보는 ID 서브필드를 개발하기 위하여 각각의 퓨즈 뱅크에 프로그래밍하기 위하여 공식화되고, 비트 또는 비트들에 대한 선택 서브필드(만약 필요하면) 및 모든 프로그래밍 정보뿐 아니라, 동일한 레지스터의 다른 비트들에 대한 선택 서브필드 및 모든 프로그래밍 정보는 변형된다. The information is formulated in order to program each of the fuse bank to develop the ID subfield, (if needed) to select the sub-field for the bit or bits, and selection of the other bit, as well as any program information, the same register sub-field and all programming information is modified. 예를 들어, 만약 BIU의 레지스터(예를 들어, 213, 403)의 하나의 비트가 변형되면, 레지스터의 다른 비트들의 디폴트 값들은 다른 퓨즈들에 기입된다. For example, if the one bit is deformed in the BIU register (e.g., 213, 403), the default values ​​of the other bits of the register are written to the other fuse. 이런 방식으로, 변형된 BIU의 레지스터들은 변형이 요구되지 않는 그의 비트들에 대하여 디폴트 값들을 제공할 것이다. In this way, the modified BIU registers will provide the default values ​​with respect to their bit modification is not required. 동작(709)시, 퓨즈 뱅크들은 솔루션으로 프로그래밍된다. Operation 709 hours, the fuse banks are programmed into solution. 일 실시예에서, 퓨즈는 퓨즈가 제 1 데이터 상태를 나타내도록 본래 상태로 유지되게 하거나 퓨즈가 제 2 데이터 상태를 나타내기 위하여 개방 또는 높은 임피던스를 생성하게 "블로잉(blowing)"함으로써 프로그래밍된다. In one embodiment, the fuse is programmed by the fuse is first maintained in the original state to indicate the data status and the fuse creates the open or high impedance to represent a second data state "blowing (blowing)". 그러나, OTP 엘리먼트들은 다른 실시예들에서 다른 방식들로 프로그래밍될 수 있다. However, OTP elements may be programmed in other embodiments in other manners. 동작(711) 시, 집적 회로는 수리 또는 조절이 성공한 것을 보장하기 위해 다시 검사된다. Operation 711, when the integrated circuit is again checked to ensure that a successful repair or adjustment. 상기 도시된 바와 같이, 집적 회로에 사용된 퓨즈들의 수는 퓨즈들이 다른 회로들 사이에서 사용되는 경우 감소될 수 있다. , The number of fuses used in the integrated circuit as shown above can be reduced when the fuses are used among other circuits. 일 실시예에서, 필요한 퓨즈들의 수는 집적 회로에 필요한 모든 가능한 퓨즈를 결정하고 이들 용도들을 서브그룹들로 그룹화함으로써 결정될 수 있고, 바람직하게 서브그룹의 퓨즈들은 기능적으로 관련된다. In one embodiment, the number of required fuses are the fuses and all the possible decisions can be determined by grouping these purposes into sub-groups, preferably of the sub-group fuses required for the integrated circuit are functionally related. 하나의 용도가 변경될 필요가 있다면, 그룹의 다른 용도들이 또한 변경될 비교적 높은 기회가 있는 경우 용도들을 그룹화하는 것은 바람직할 수 있다. If you need one of the purposes is to be changed, but for grouping purposes if there is a relatively high chance to be changed for any other purpose of the group may also be desirable. 일 실시예에서, 퓨즈들의 수는 리던던시 수리 및 비리던던시 튜닝, 최적화 또는 모드 선택에 속하는 최대 가능한 용도들의 작은(<25%) 부분일 것이다. In one embodiment, the number of fuses would be small (<25%) portion of the maximum possible use belonging to the redundancy-repaired and non-redundancy-tuned, or optimized mode selection. 일 실시예에서, 퓨즈 뱅크들의 수는 미완성 제조 프로세스에서 제품의 초기 방출을 위하여 보다 클 것이라 생각된다. In one embodiment, the number of fuse banks is thought that greater than for the early release of product in unfinished production process. 제안된 솔루션의 장점은 퓨즈 뱅크들의 수가 시스템의 다른 구현을 상세히 변경하지 않고 제품 수정들 사이에서 변형될 수 있다. The advantage of the proposed solution is the number of fuse banks can be transformed between the product modified without changing any other detail the implementation of the system. 퓨즈들의 집적 회로를 설계, 제조, 검사 및 프로그래밍하기 위한 다른 프로세스들은 다른 실시예들에 사용될 수 있다. Design of an integrated circuit fuse, manufacturing, testing, and other processes for programming may be used in other embodiments. 시스템(101)에 사용될 수 있는 퓨즈들의 예들은 폴리사이드 퓨즈들, 금속 퓨즈들, 또는 레이저 프로그램 가능 퓨즈들을 포함한다. Examples of fuses that can be used in the system 101 comprise the polycide fuse, the fuse metal, or laser programmable fuse. 그러나, 다른 실시예들에서, 다른 타입들의 1회 프로그램 가능 엘리먼트들은 프로그램 가능 ROM(판독 전용 메모리) 셀들, 예를 들어 전기적으로 프로그램할 수 있는 ROM들 같은 퓨즈들 대신 사용될 수 있다. However, in other embodiments, one time programmable elements of different types may be used in place of the fuse of the programmable ROM (read only memory) cells, for example, ROM that can be electrically programmable. 일 실시예에서, 시스템은 제조 후 검출된 결함 메모리 셀들을 대체하기 위하여 리던던트 메모리 셀들을 포함하는 메모리 어레이 회로를 포함한다. In one embodiment, the system comprises a memory array circuit comprising a redundant memory cell for replacing a detected defective memory cell after manufacture. 시스템은 또한 비 메모리 어레이 회로를 포함한다. System also includes a non-memory array circuit. 비 메모리 어레이 회로는 동작 전류, 동작 전압, 저항, 캐패시턴스, 컨덕턴스, 인덕턴스, 주파수, 타이밍 특성, 동조 특성, 한 세트의 회로들로부터 하나의 회로의 선택 및 동작 모드로 이루어진 그룹의 동작 파라미터의 제조 후 조절을 위한 회로를 포함한다. Non-memory array circuit operating current, operating voltage, resistance, capacitance, conductance, inductance, frequency, timing characteristics, the tuning characteristics, after production of the operating parameters of the group consisting of from the circuit of the set to select and mode of operation of a circuit and a circuit for the control. 시스템은 1회 프로그램 가능 엘리먼트를 포함한다. The system comprises a one time programmable elements. 1회 프로그램 가능 엘리먼트는 제조 후 시스템을 변형하기 위한 정보를 저장하기 위해 프로그램 가능하다. One time programmable element is programmable to store information for modifying the system after preparation. 1회 프로그램 가능 엘리먼트 는 메모리 어레이 회로 및 비메모리 어레이 회로를 포함하는 회로들 그룹 중 임의의 하나로 제조 후 프로그램 가능하게 할당할 수 있다. One time programmable element may be assigned possible after production program of any one of the circuit group including a memory array circuit and a non-memory array circuit. 1회 프로그램 가능 엘리먼트는 제조 후 검출된 메모리 어레이 회로의 결함 메모리 셀을 대체하고 그리고 비 메모리 어레이 회로의 동작 파라미터의 제조 후 조절하는 것을 포함하는 그룹 중 임의의 하나에 대한 정보를 저장하기 위하여 프로그램 가능하다. One time programmable element is programmable to store information about any one of a group comprising the substitution of a defective memory cell in the memory array circuitry detected after production and and adjustment after production of the operating parameters of the non-memory array circuitry Do. 시스템은 1회 프로그램 가능 엘리먼트에 저장된 프로그래밍된 정보를 수신하기 위하여 1회 프로그램 가능 엘리먼트에 결합된 제어 회로를 포함하고, 상기 제어 회로는 메모리 어레이 회로 및 비 메모리 어레이 회로에 결합되어 1회 프로그램 가능 엘리먼트가 프로그램 가능하게 할당된 회로들의 그룹 중 하나에 1회 프로그램 가능 엘리먼트에 저장된 프로그래밍된 정보를 제공한다. System is one time programmable to receive the programming information stored in the enable element includes a control circuit coupled to the one time programmable elements, the control circuit is coupled to the memory array circuit and a non-memory array circuit one time programmable elements and the one of the programs available to the group of assigned circuit provides the programming information stored in the one time programmable elements. 다른 실시예에서, 집적 회로에서, 시스템은 하나 또는 그 이상의 결함 메모리 셀들을 대체하기 위하여 제조 후 리던던트 메모리 셀들로 수리될 수 있는 하나 또는 그 이상의 수리 가능한 메모리 어레이 회로들을 포함한다. In another embodiment, the integrated circuit, the system comprising: one or more repairable memory array circuits that can be repaired with the redundant memory cells after production in order to replace one or more defective memory cells. 시스템은 또한 비 메모리 어레이 회로들의 하나 또는 그 이상의 동작 파라미터들을 변형함으로써 제조 후 조절될 수 있는 하나 또는 그 이상의 메모리 어레이 회로들을 포함한다. The system also includes one or more memory array circuits that can be adjusted after manufacture by modifying one or more operating parameters of the non-memory array circuit. 시스템은 하나 또는 그 이상의 동작 파라미터들을 변형하기 위하여 하나 또는 그 이상의 비 메모리 회로들에 할당되거나 리던던트 메모리 셀들로 하나 또는 그 이상의 결함 메모리 셀들을 대체하기 위하여 하나 또는 그 이상의 수리 가능한 메모리 어레이 회로들 중 임의의 것에 할당된 프로그래밍할 수 있는 다수의 1회 프로그램 가능 엘리먼트들을 더 포함한다. The system any of the one or one to transform more operating parameters or more non-memory assigned to the circuit, or one to as redundant memory cells to replace one or more defective memory cells or more repairable memory array circuitry the programming of the plurality of one-time programmable elements that can be assigned to be further included. 다른 실시예에서, 시스템은 프로그래밍된 리던던시 수리 정보에 따라 결함 회로를 대체하기 위하여 리던던트 회로로 제조 후 수리할 수 있는 제 1 회로를 포함한다. In another embodiment, the system includes a first circuit that can be made of a repair after a redundant circuit to replace a defective circuit according to the programmed redundancy repair information. 시스템은 프로그래밍된 조절 정보에 따라 제 2 회로의 동작 파라미터를 변형함으로써 제조 후 조절할 수 있는 제 2 회로를 포함한다. The system includes a second circuit that can be adjusted after manufacture by modifying the operating parameters of the second circuit according to the programmed control information. 시스템은 프로그램 가능한 퓨즈들의 다수의 세트들을 더 포함한다. The system further includes a plurality of the set of programmable fuses. 다수의 각각의 세트는 제 1 회로 및 제 2 회로를 포함하는 회로들 그룹의 임의의 하나에 할당되도록 프로그램할 수 있다. Number of each set may be assigned to program any one of a group of circuits including a first circuit and a second circuit. 시스템은 프로그램 가능한 퓨즈들의 다수의 세트들로부터 정보를 수신하기 위하여 프로그램 가능한 퓨즈들의 다수의 세트들에 결합된 제어 회로를 더 포함한다. The system further includes a control circuit coupled to the plurality of the set of programmable fuses in order to receive information from a plurality of the set of programmable fuses. 제어 회로는 제 2 회로에 할당된 다수의 세트들의 프로그램 가능 퓨즈들로부터 제 2 회로 프로그래밍된 조절 정보에 제공하기 위하여 제 1 회로에 할당되고 제 2 회로에 결합된 다수의 세트들의 프로그램 가능 퓨즈들로부터 제 1 회로 프로그래밍된 리던던시 수리 정보를 제공하기 위한 제 1 회로에 결합된다. The control circuit from the second programmable fuse of being assigned to a first circuit a plurality of sets coupled to a second circuit in order from the programmable fuse of the plurality of sets assigned to the circuit to provide the second control information programming circuit the is coupled to a first circuit for providing a first redundancy repair information programmed circuit. 본 발명의 특정 실시예들이 도시 및 기술되었지만, 당업자는 여기에서의 지침을 바탕으로, 추가 변화들 및 변형들이 보다 넓은 측면들 및 본 발명으로부터 벗어나지 않고 이루어지고, 따라서 첨부된 청구항들은 본 발명의 사상 및 범위 내에 있는 모든 상기 변화들 및 변형들을 그 범위내에 포함한다. Specific embodiments of the invention have been shown and described, those skilled in the art the claims on the basis of instructions of the here, made without departing from further changes and modifications in broader aspects, and the invention, therefore the annexed spirit of the invention and it includes all such changes and modifications falling within the scope within their scope. 상기 1회 프로그램 가능 엘리먼트에 저장된 프로그래밍된 정보를 수신하기 위하여 상기 1회 프로그램 가능 엘리먼트에 결합된 제어 회로로서, 상기 1회 프로그램 가능 엘리먼트가 프로그램 가능하게 할당된 회로들의 상기 그룹 중 상기 하나에 상기 1회 프로그램 가능 엘리먼트에 저장된 프로그래밍된 정보를 제공하기 위하여 상기 메모리 어레이 회로 및 상기 비메모리 어레이 회로에 결합되는, 상기 제어 회로를 포함하는, 시스템. The one program as a control circuit coupled to the one time programmable elements in order to receive the programming information stored in the possible elements, wherein the one time programmable element is the said one of the groups of circuit allocation possible program 1 , the system including the control circuit, coupled to the memory array circuit and the non-memory array circuit to provide the programming information stored in the time programmable elements. 상기 제어 회로는 상기 1회 프로그램 가능 엘리먼트에 저장된 정보를 제공하기 위해 상기 버스를 통해 상기 메모리 어레이 회로 및 상기 비메모리 어레이 회로에 결합되는, 시스템. The control circuit system coupled to the memory array circuit and the non-memory array circuitry via the bus to provide information stored in the one time programmable elements. 회로들의 상기 그룹 중 상기 임의의 하나에 상기 1회 프로그램 가능 엘리먼트를 프로그램 가능하게 할당하기 위한 정보를 저장하기 위한 제 2의 1회 프로그램 가능 엘리먼트를 더 포함하는, 시스템. Circuits of the system further comprises a one time programmable elements of second to store information for programmable to assign the one time programmable element in the any of the groups. 상기 1회 프로그램 가능 엘리먼트는 퓨즈인, 시스템. The one time programmable fuse element of the system. 상기 리던던트 메모리 셀들로 상기 하나 이상의 결함 메모리 셀들을 수리하기 위해 상기 하나 이상의 수리 가능한 메모리 어레이 회로들 중 임의의 것에 할당되거나 상기 하나 이상의 동작 파라미터들을 변형하기 위하여 상기 하나 이상의 비메모리 회로들 중 임의의 것에 할당되도록 프로그램 가능한 다수의 1회 프로그램 가능 엘리먼트들을 포함하는, 시스템. With the redundant memory cells in any of the one or more defects as possible the one or more repair to repair the memory cells of memory array wherein one or more of the non-memory circuit of the circuit in order to modify operating parameters of one or more assigned or said that any , the system comprising a plurality of program one time programmable elements can be assigned. 상기 제어 회로는 상기 다수의 1회 프로그램 가능 엘리먼트들에 프로그래밍된 정보를 제공하기 위하여 상기 버스에 결합되는, 시스템. The control circuit, the system coupled to the bus to provide the information programmed in the available number of elements times the first program. 제어 회로는 데이터 유닛들로 상기 다수의 1회 프로그램 가능 엘리먼트로부터의 상기 정보를 제공하고, 상기 버스상에 제공된 상기 데이터 유닛들은 데이터 유닛이 변형을 위한 정보를 포함하는 상기 하나 이상의 비메모리 어레이 회로들 또는 상기 하나 이상의 수리 가능한 메모리 어레이 회로들 중 지정된 하나를 식별하기 위한 식별자를 각각 포함하는, 시스템. The control circuit of the one or more non-memory array circuitry that provides the information from the plurality of one-time programmable elements into data units, the data units are data units provided on said bus includes information for the modified Alternatively, the system comprising an identifier for identifying a given one of the one or more repairable memory array circuit. 각각의 데이터 유닛을 위한 상기 식별자는 상기 다수의 1회 프로그램 가능 엘리먼트들에 프로그래밍되는, 시스템. The identifier for each data unit, the system being programmed to a number of the one time programmable elements. 상기 다수의 1회 프로그램 가능 엘리먼트들 각각은 퓨즈인, 시스템. Each of the plurality of one-time programmable elements are fuses in the, system. 상기 하나 이상의 비메모리 어레이 회로들은 클럭 회로를 포함하고, 상기 하나 이상의 동작 파라미터들은 상기 클럭 회로의 클럭 라인의 다수의 지연들 중 지정된 지연을 포함하는, 시스템. The one or more non-memory array circuits comprises a clock circuit, and the one or more operating parameters, the system comprising a given delay of the plurality of delay lines of the clock of the clock circuit. 상기 하나 이상의 동작 파라미터들은 상기 전압 조정기 회로의 전압 조정기에 의해 제공된 조정된(regulated) 전압 레벨을 포함하는, 시스템. The one or more operating parameters, the system comprising the adjusted (regulated) voltage level provided by the regulator of the voltage regulator circuit. 상기 하나 이상의 비메모리 어레이 회로들은 위상 로킹 루프 회로(phase lock loop circuit)를 포함하고, 상기 하나 이상의 동작 파라미터들은 상기 위상 로킹 루프 회로의 위상 로킹 루프의 튜닝 파라미터 또는 타이밍 파라미터를 포함하는, 시스템. The one or more non-memory array circuits are phase locked loop circuit (phase lock loop circuit) operations including, and one or more of the parameters, the system including the tuning parameters or timing parameters of the phase locked loop of the phase locked loop circuit. 상기 하나 이상의 동작 파라미터들은 상기 전력 관리 유닛의 동작 모드, 시스템 동작 전압, 및 시스템 주파수로 이루어진 그룹 중 적어도 하나를 포함하는, 시스템. The one or more operating parameters, the system comprising at least one of the group consisting of operating modes, the system operating voltage, and the system frequency of the power management unit. 상기 하나 이상의 동작 파라미터들은 동작 전류, 동작 전압, 레지스턴스, 캐패시턴스, 컨덕턴스, 인덕턴스, 및 타이밍 특성으로 이루어진 그룹 중 적어도 하나를 포함하는, 시스템. The one or more operating parameters are the operating current, operating voltage, resistance, capacitance, conductance, inductance, and timing characteristics comprises at least one of the group consisting of, the system. 상기 그룹의 하나 이상의 동작 파라미터들은 상기 디지털 논리 회로의 디지털 논리의 동작 파라미터 및 상기 아날로그 회로의 아날로그 회로의 동작 파라미터로 이루어진 그룹 중 적어도 하나를 포함하는, 시스템. One or more operating parameters of the group, the system comprising at least one of the group consisting of operating parameters of the analog circuitry and the analog circuitry of the operating parameters of the digital logic of the digital logic circuit. 상기 다수의 1회 프로그램 가능 엘리먼트들은 상기 하나 이상의 수리 가능한 메모리 어레이 회로들의 하나 이상의 동작 파라미터들을 변형하기 위해 상기 하나 이상의 수리 가능한 메모리 어레이 회로들 중 임의의 것에 할당되도록 프로그램 가능한, 시스템. The plurality of one-time programmable elements are at least one repairable memory array circuitry programmable, the system to be assigned to any of the one or more repairable memory array circuitry to modify one or more operating parameters of the. 상기 다수의 프로그램 가능한 퓨즈들의 세트들로부터 정보를 수신하기 위하여 상기 다수의 프로그램 가능한 퓨즈들의 세트들에 결합된 제어 회로로서, 상기 제 1 회로에 할당된 상기 다수의 세트들의 프로그램 가능한 퓨즈들로부터 상기 제 1 회로로 프로그래밍된 리던던시 수리 정보를 제공하기 위하여 상기 제 1 회로에 결합되고 상기 제 2 회로에 할당된 상기 다수의 세트들의 프로그램 가능한 퓨즈들로부터 상기 제 2 회로로 프로그래밍된 조절 정보를 제공하기 위하여 상기 제 2 회로에 결합되는, 상기 제어 회로를 포함하는, 시스템. A control circuit coupled to the set of the plurality of programmable fuses in order to receive information from the set of the plurality of programmable fuses, the second from the programmable fuse of said plurality of set allocated to the first circuit in order to provide a redundancy repair information programmed into the first circuit said to provide the control information programmed and coupled to the first circuit from the programmable fuse of said plurality of set allocated to the second circuit to the second circuit , the system including the control circuit coupled to the second circuit. 상기 제 1 회로는 제 1 수리 가능한 메모리 어레이 회로를 더 포함하고 상기 제 2 회로는 제 2 수리 가능한 메모리 어레이 회로를 더 포함하는, 시스템. The first circuit includes a first service further comprises a memory array circuit and the second circuit, the system further comprising a second repairable memory array circuit. 상기 제 1 회로는 제 1 수리 가능한 메모리 어레이 회로를 더 포함하고 상기 제 2 회로는 비메모리 어레이 회로를 더 포함하는, 시스템. The first circuit includes a first service further comprises a memory array circuit and the second circuit, the system further comprises a non-memory array circuit. 상기 다수의 프로그램 가능한 퓨즈들의 세트들 각각은 상기 다수의 프로그램 가능한 퓨즈들의 세트들 각각이 할당된 상기 제 1 회로 및 상기 제 2 회로를 포함하는 회로들의 상기 그룹 중 하나를 식별하는 식별자를 저장하기 위해 프로그램 가능한, 시스템. Each of a set of a plurality of programmable fuses, to store an identifier identifying one of said group of circuits including the first circuit and the second circuit are each of a set of a plurality of programmable fuse assigned programmable, system. 상기 제어 회로는 상기 프로그래밍된 리던던시 수리 정보 및 상기 프로그래밍된 조절 정보를 통신하기 위해 상기 버스를 통하여 상기 제 1 회로 및 상기 제 2 회로에 결합되는, 시스템. The control circuit is the programmed redundancy and repair information, the system coupled to the first circuit and the second circuit through said bus for communicating the programmed control information.